Nothing of any significance ever occurs or is ever built without someone first dreaming about it. Books are the treasured wealth of the world and the fit inheritance of generations and nations … Their authors are a natural and irresistible aristocracy in every society, and, more than kings or emperors, exert an influence on mankind. includes an essay on Spirit and a Tribute to Dr. Martin Luther King, Jr. The poet is often referred to as a “seer.” He may have a different vision, but he doesn’t really “see” the world differently than everyone else nor does he have any special capacity of knowing, understanding, or answering its complexities. The poet uses language like an artist uses a brush to add a little color in pinpointing moments just enough to let it be known that all human traits are universal. Besides, we are all poets. A few of us simply take the time to transfer our poetry to the written word. I’ve often wondered about the spiritual force behind the creative process. What is that motivating force that drives some of us beyond normal levels of endurance to challenge the unknown and/or to create? Spirit is the powerhouse of imagination. It is the driving force that motivates us to communicate experiences and ideas to future generations. Imagination fuels dreams and dreams are the gateway to the future. No one understood the power of a dream more than Martin Luther King Jr.
Edna Hibel is one of America’s most prominent colorists, known primarily for her “Mother & Child” images. She is the only female artist since the 16th century and one of only a handful of artists throughout history to produce paintings in nine consecutive decades. In 2001 she became the second woman, as well as the second American, to receive the prestigious Leonardo da Vinci World Award of Arts. Respected as much for her gentle, loving spirit as she is for her art, Edna has traveled the globe with her paintbrush and easel capturing images on her canvas that have endeared her to a multitude of adoring fans for the better part of a century. She has met royalty, celebrities, and common people from all walks of life along the way. Her genuine affection for people is not filtered through a barometer of class, culture, economics, or stature. She treats everyone the same and views their diversity as unique brush strokes. This is her story. This authorized biography is based on her recollections with a concerted effort to capture her personality and character. This is the personal side of a very popular artist. Constantin Stanislavaski, father of the Method School of Acting at the Moscow Art Theatre in the Nineteenth Century, described the theatre as a jealous mistress. By that he meant that once she seduces you, she will dominate you, and demand 110 percent of your attention and devotion with no guarantees in return. 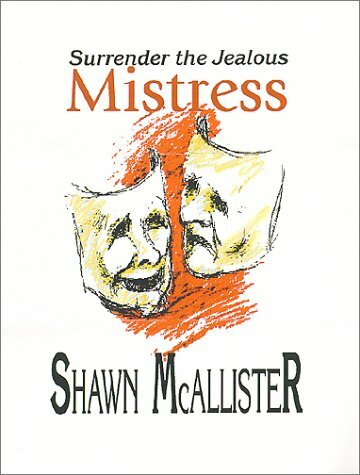 Surrender the Jealous Mistress is the autobiographical story of Shawn McAllister's theatrical life. My reason for writing about my acting career was that I came to realize it was the most effective way I had of helping to preserve my heritage. This heritage thing became important to me when my grandchildren responded to seeing one of my movies, expressing amazement that their grandpa was an actor, because I suddenly realized that I had no idea what my grandfathers (who both died before I was born), and their fathers before them, did for a living. I have no journals, or documents, or letters from my ancestors that would allow me to glimpse into their minds. I wanted to make sure that my descendants had access to that which I was denied. Therefore, I set about to document the story of my life as an actor, complete with the hows and whys I chose such a path. I encourage everyone to tell their life's story through the written word. It's the most precious gift you can give those you love. Creating Harmony – Bonnie Goodman, M.S., L.M.H.C. My advice to anyone who wants to write is to stay flexible. Be serious about writing, but don't take your writing seriously. Never think that the words you compose are biblical in nature. The magic of the creative mind is that it is constantly willing to massage, manipulate, and mold ideas. For the writer, that means having the ability and willingness to play with words. We are, after all, called wordsmiths.